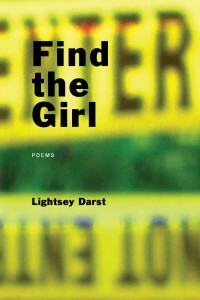 Lightsey Darst’s Find the Girl (Coffee House Press; 2010) is not a collection to be read hastily or casually. I made that mistake when I first sat down with the collection, and struggled to connect with the poems. It wasn’t until I really dug into the collection that I found the threads that tie all the poems together. Darst’s collection isn’t for everyone, but for those readers whose tastes are bold, and those writers interested in pushing the boundaries of form, Find the Girl is recommended reading. The symbols serve to break apart the text and fracture the images, which was, for me, a turn off during my first reading. What I discovered upon subsequent readings was that image fracture and the breaking apart of the poem are exactly what Darst is trying to do. “Tunnel” goes on to describe a girl being assaulted in a tunnel after deciding “to save a / minute” by taking a short cut. Each typographic fracture acts as the tunnel in question: there’s the girl’s life before the tunnel, and her life after, broken in the middle by what happens between one side and the other, what happens between the brackets. Reading these poems together allows the themes of violence/horror, girl/womanhood, and gossip/bullying to build until each poem feels like a continuation of the last. Each piece doesn’t fit together neatly, fracturing the larger whole just as the poems themselves are fractured, but the reading experience is rewarding if the reader allows the time necessary to dig in. Once the reader accepts that Darst isn’t going to make the reading easy and succumbs to the logic of the poems, the visceral images begin to leap off the page. Darst’s frank and urgent poems aren’t for everyone, but I found myself quite taken with the collection the more I read. The poems live in a fragmented corner of modernest poetry, and in the same tradition of Adrianne Rich and Dorianne Laux, though perhaps slightly harder to approach. I look forward to Darst’s future work. What books or poets did you struggle to enjoy at first, but eventually proved to be rewarding reads?